Since the use of networking solution seems to increase dramatically, it made sense to describe how to create your own UTP networkcables. As with most thing: it's not difficult once you have seen how it's being done. Short intro: what do we need and what type of cables can we make? These are the cables we normally use to connect a PC to hub, switch or router on their LAN connections. The other side is connected to the networkcard (NIC) of your PC or laptop. This is a 1 to 1 connection. We use these cables for either connecting one PC directly to another PC, or for creating an uplink from one hub/switch/router to another hub/switch/router. Transmission and reception signals are swapped. The RJ45 crimptool is a special tool for RJ45 connectors. The connectors are rather cheap,... however can be used only once! 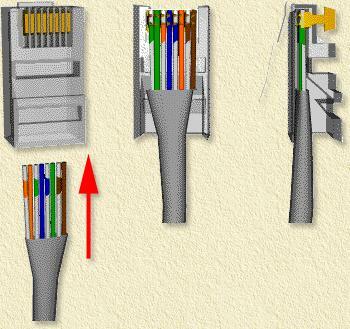 Get a piecee of CAT-5 cable, the length does not really matter, just keep it shorter than a 100 meters (app. 300 foot). CAT-5 is a quaity indication of the cable you're using. The cables we're suggesting here are suitable for 10 Mbps, 100 Mbps and even 1000 Mbps (Gigabit network), allthough you will all 8 wires in the cable. Proper quality cable uses the colors for the wires as described in this article. You do not need to use the same color order, but it is highly recommended to do so anyway, as it might make life easier later on. How to create a straight cable? First we strip the outer protection layer of the cable, easiest done by using a simple sharp knife. Be carefull not to damage the inner wires when doing so. You do NOT need to strip the individual wires! Set the wires in the order described below. This order must be used on both cabel ends. Now hold the wires next to each other and use the siccors to cut them in 1 cut to the same lenght. Now gently shift the RJ45 over the wires. - Make sure the wires go into the RJ45 as far as possible. Tip: Make sure the mantel of the cabel also goes into the connector, so it will be crimped into the connector as well. Now we can crimp the connector using the RJ45-crimptool. Tip: Before crimping the connector, make sure the colors are in the right order. With most RJ45-crimptools, you might need to squeeze more than once, just to make sure the connector is connected properly. Now repeat these steps for the other end of the cable as well, and your cable will be finished. How to create a crossed cable? A crossed cable is created in the same way as a straight cable, with one minor difference. 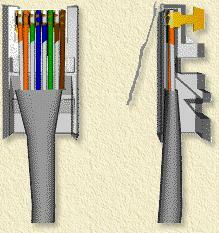 For one end of the cable, do the steps as described for the straight cable. Note: ONLY for ONE end of the cable! Note: Only for ONE end of the cable! The other end needs to be done in the same way as for a straight cable. Crimp the connector to the cable as done with a straight cable. Make sure you use the different order of the wires as shown below.